Most people know about Hyaluronic Acid (HA). It is a natural substance found in your body where it provides moisture, plumpness, firmness and suppleness to the skin. HA can also be found in the eyes and in the joint places, where it acts as a lubricant. Ever wonder how a baby's skin always look so dewy? It is because babies are born with high amount of Hyaluronic Acid which keeps their skin plump and smooth. As your grow older, the body will produce lesser Hyaluronic Acid over time and the skin will look duller and drier. Still, there are a lot of ways to get your skin to restore the skin's Hyaluronic acid content and see benefits in getting a softer, smoother and more hydrated skin. If you are very rich, you can always get Hyaluronic Acid fillers to be injected directly into the sunken areas. That is if you are very rich lah.... If you are very poor like me, you can choose to use products with Hyaluronic Acid content. Hada Labo Hydrating Lotion has been famous for its Hyaluronic Acid (HA) content in the lotion. Hada Labo even came out with the latest lotion with latest New High Performance Penetrating and Deep Moisturising (HPP&M) Technology. The technology infuses 4 types of HA molecules into different skin layers actively. Large-size HA - Forms a layer of moisture retaining barrier to protect skin from moisture loss. It covers the Medium-size HA firmly to effectively provide skin with a powerful double later moisture-locking shield to lock in moisture on skin. 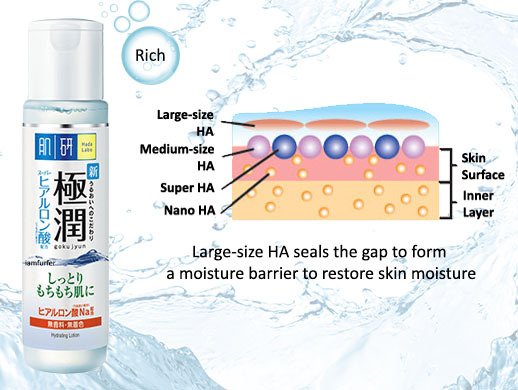 Small-size HA - New generation of HA, small molecule size of HA seals the gap of Medium-size HA to form a high density moisture barrier on skin surface to restore skin moisture. Nano HA - With the fine molecule size of 1/20 of HA, it easily penetrates and infuses moisture deep into the skin to prepare skin for enhanced skin care ingredients absorption. The 4 types of Hyaluronic Acid (HA) in Hada Labo Hydrating Lotion (Light) helps to deeply hydrate skin and preserve its optimum moisture balance. 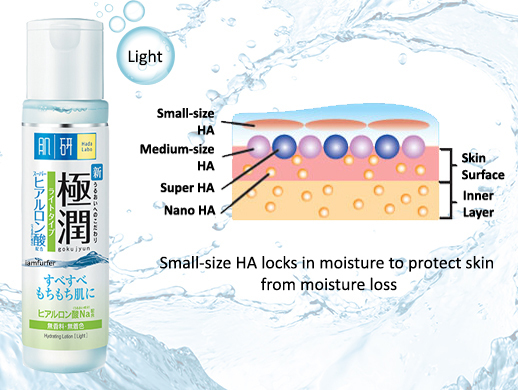 The small-size HA locks in moisture to protect from moisture loss and improve dehydrated skin condition. The light texture of this lotion suits those who are having normal to oily skin, or combination of both. You can also use this lotion as a mask on your face as it has what it takes to give you the best HA to your skin. The other Hada Labo Hydrating Lotion is targeted to keep the skin moisturised at all times. The 4 types of Hyaluronic Acid (HA) which includes the large-size HA, helps to seal the gap and form a moisture barrier to restore skin moisture level. The rich texture of this lotion is targeted for those who are having dry to normal skin, compensate the skin from moisture loss. Both Hada Labo Hydrating Lotion and Hada Labo Hydrating Lotion (Light) are having similar texture and leaving a non-sticky feel after application. They are in clear watery fluid and does not have strong fragrance. Hada Labo Hydrating Lotion's texture is slightly thicker than the light one. The rich texture does not make the lotion to be sticky on skin after application. 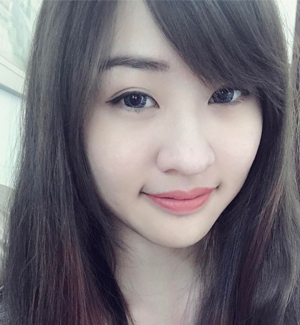 An advice here: You can always try out the light Hada Labo Hydrating Lotion first if you think the rich one may not suit your skin. Once your skin has adapted to the light version, you can try out the rich version to see if your skin can adapt to its texture as well. All leading pharmacies and hypermarkets, including Watsons, Guardians and Caring.